We enjoyed this very special recipe as a salad last weekend. It would also make a lovely appetizer or side dish. Trim the woody ends of the asparagus off. Bring a large frying pan of lightly salted water to boil. Add the asparagus and cook until al dente. Once cooked, plunge them into cold water to stop the cooking process. While the asparagus are cooking, prepare the sauce. Place the soy yogurt in a medium sauce pan. Mix the white wine and vegetable bouillon to dissolve the bouillon. Add the wine and bouillon to the soy yogurt. In 2 or 3 tablespoons of white wine, dissolve the saffron threads, or alternatively mix the turmeric. Add to the sauce and mix well. Place the sauce on a low heat. Clean and chop the flat-leaf parsley. Prepare the edible flowers. Make sure the flowers you have chosen are edible and suited for consumption. Separate the petals you wish to use, and choose which you which to keep whole. 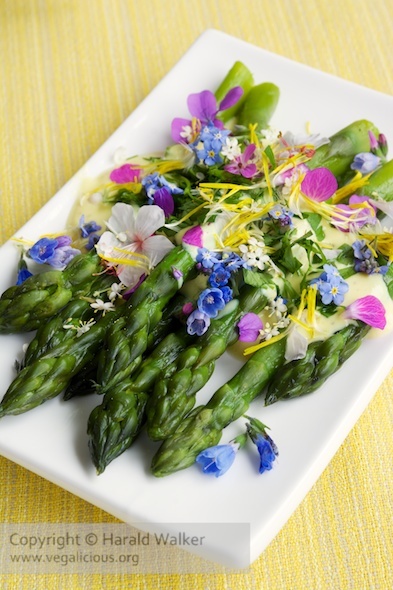 To serve: Place the asparagus spears on individual plates. Drizzle a generous amount of the sauce over the asparagus. Sprinkle some of the chopped parsley over the sauce and then add the flowers. This is nice served either warm or cold. 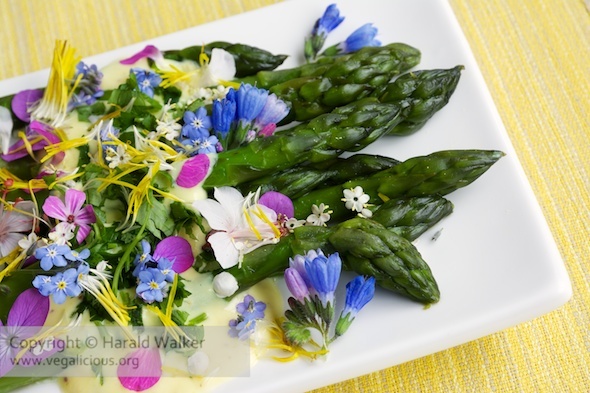 Posted by Chris Walker on May 13, 2014 in Asparagus, Edible flowers, Salads.